The UI Mellon Sawyer Seminar was a yearlong interdisciplinary collaboration dedicated to mapping cultural exchanges across Eurasia from roughly 400 CE ­ ca. 1450 CE, by focusing on the development, distribution, and sharing of manuscript technologies. Funded by a major grant from the Andrew W. Mellon Foundation, with support from the Obermann Center, the seminar, Cultural and Textual Exchanges: The Manuscript Across Pre-Modern Eurasia, was led by Timothy Barrett (Center for the Book, Graduate College), Paul Dilley (Classics and Religious Studies, CLAS), Katherine Tachau (History, CLAS), and our Mellon-funded Obermann Postdoctoral Fellow, Melissa Moreton. From October through May, 25 internationally distinguished scholars and conservators visited campus to share their expertise in the various manuscript cultures of pre­modern Eurasia. Bringing scholars together from disparate fields and geographic loci was also significant. Zoroastrian, medieval Afro-Eurasian, Pali, and Yemeni Zaydi manuscripts were among the many lecture topics. The Seminar group was comprised of University of Iowa and Grinnell College faculty and graduate students from Religious Studies, Classics, Center for the Book, Library & Information Science, and History. The group convened approximately 15 times over the course of the 2016–17 academic year. 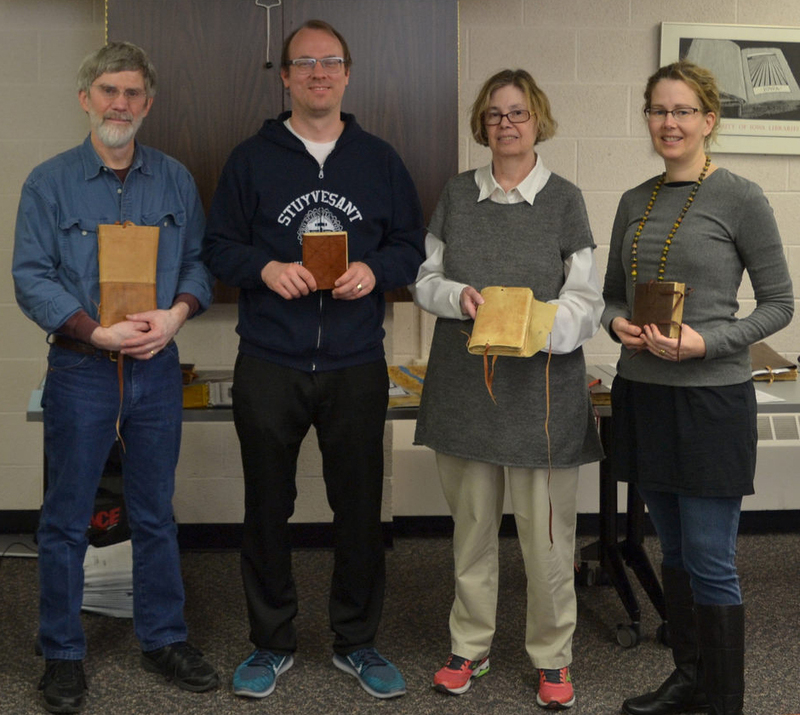 Five of the seminar meetings included workshops in which participants reproduced historically significant book structures with their associated materials under the guidance of book conservators and book binders. In 2017–18, Moreton and Dilley will work on a digital mapping project to represent and share the findings from the seminar. Brent Seales, Professor and Chair of Computer Science and Director of the Center for Visualization and Virtual Environments (Vis Center), University of Kentucky.